Product #20572 | SKU JB01281 | 0.0 (no ratings yet) Thanks for your rating! The XXL charcoal UltraFit Sling Strap For Men from Joby provides a safe and rapid way to carry and use your DSLR, CSC (compact system camera) or super zoom camera. The UltraFit is designed for immediate access to your camera by providing a smooth glide up to eye level. With Joby's SpeedCinch System, you can quickly adjust the strap to your comfort and shooting style. Simply pull your camera and the circular chest pivot ring in opposite directions. This custom fits the strap to the contour of your body. The strap locks in the rear for added security when moving around or in crowded places. The 1/4" thumbscrew easily screws into the tripod socket of your camera. A built-in ball bearing inside the 1/4"-20 screw allows your camera to spin or rotate negating the need to remove the strap at all. The strap's Pivot Ring gives you the freedom to conform the strap to fit your body in a way that is both comfortable and secure. 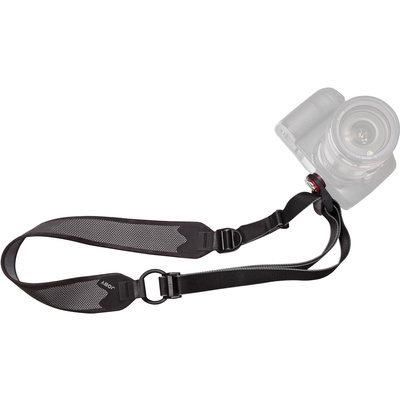 The strap is designed to evenly distribute the weight of your camera thereby minimizing strain on back, neck and muscles.